I really love my Women’s KJV Study Bible. I began studying the book of Joshua this morning, and in chapter one is an article by Roberta Parham Hromas (from Passport to the Bible) that I feel led to share. It fits perfectly with my new series here on God’s Word, this must be more of God’s Perfect Timing! Enjoy! Start by reading ten minutes a day. The truth of the Bible is like food for your soul. The Bible will literally become a part of you, and your hunger for God’s Word will increase if you begin reading God’s Word daily. If you find that ten minutes a day isn’t enough to satisfy your spiritual hunger for the Word, try ten minutes in the morning and ten minutes in the evening. You may need several ten-minute feedings throughout the day. Make sure you have a small, readable copy of the Bible that you can carry with you. Ask God to guide your reading. 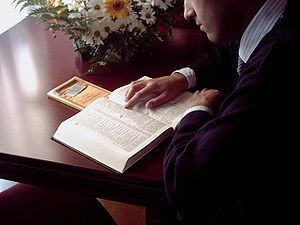 If you have difficulty concentrating as you read, read the Bible out loud. Read as if God is speaking directly to you. Always look for the personal application.God knows the number of hairs on your head, and he desires to make his Word come alive to you in practical, personal ways. This does not mean that you are the sole source of interpreting the Bible or that you can bend the Bible’s message to fit your own life and your own ideas. Bible truths are eternal and absolute. The Bible spans all cultures, history, social levels, and occupations, all ages, races, and nationalities. But the way in which a particular passage of the Bible applies to your circumstances and your experience is unique to you each day. If a verse stands out to you in a particular way, write it down on a card and carry it with you all day. Read it over and over. Think about why the verse stood out to you. 1. Word and Subject Studies – This approach to study begins with the question, “I wonder what the Bible has to say about…?” The word or topic you choose is the subject of your study! Use a concordance to look up various references from Genesis to Revelation. With pencil and paper in hand, begin to look up references, and as you read each one, write down a few words that summarize what you believe to be a practical meaning or application of the verse to your life. Be sure to look up a number of verses or passages in both the Old Testament and New Testament–perhaps a dozen or more verses or passages. You may also want to look up synonyms (similar words) and antonyms (opposite words). Word and subject studies make great devotional studies to share with others. They reveal the nature of God and God’s “opinion” on a wide variety of problems and issues. 2. Journey Studies – The Bible tells the story of many journeys–both journeys of individuals and the journey of the children of God. A study of these journeys can help us see that life happens in stages…situations do change…and that no circumstance lasts forever. Life has good times and bad times. You may want to study the journeys of these men and women: Joseph, the Children of Israel as they left Egypt, Abraham and Sarah, David, Paul, and most certainly, Jesus. Journey studies lead us to an understanding that life is in constant motion and that natural life has a progression to it. 3. Progression Studies – In progression studies we are concerned with progress in our spiritual lives. The Christian life must have an upward trend so that we are always growing more into the likeness of Christ, closer to God, and upward in spirit. Some very familiar passages may be read in a progressive way that reveals growth toward spiritual maturity, including the Beatitude portion of the Sermon on the Mount (Matthew 5:3-12), Psalm 22-24 (which gives insight into Jesus as our Shepherd), Galatians 5:22-23 (one character trait gives rise to the next as we bear the fruit of the Spirit), Ephesians 3:14-19 (a spiritual progression for those who pray with boldness and confidence), 1 Thessalonians 5:16-18 (for those who are living in the day of the Lord’s return). As you engage in a progression study, read the whole before dissecting the parts. Look for a strong relationship among the verses–don’t contrive a relationship that doesn’t exist; check your progression with other Scriptures; keep in mind that the last verse or last passage must bring you closer to Jesus than the first. 4. Type and Shadow Studies – A rewarding way to study the Old Testament is to look for the people, objects, and events that cast spiritual shadows. These studies reflect “types” of experiences and events that happen to us on a spiritual level today. In themselves, the stories are about Old Testament people and events. The shadows of these stories tell us more about God, outlining for us the nature and working of God on the spiritual level. As such, they tell us a great deal about our spiritual selves and help us understand our spiritual purpose. Type and shadow studies reveal the interplay of the Holy Spirit and Jesus in our lives as we make the steps. How do these studies differ from Journey and Progression studies? Journey studies show how God works in our natural lives; type and shadow studies, in contrast, show us the master plan for our lives in the context of eternity. Progression studies make us aware of the steps that occur in spiritual growth. A type and shadow study, in contract, tells us how these steps occur and why. The story of Ruth (Book of Ruth) is a good story for type and shadow studies. (Ask: who is Ruth? Who is Boaz? Who is Naomi?) The way in which God dealt with the Children of Israel in the Book of Deuteronomy makes a good type and shadow study, as do the stories of Esther, Jonah, and Job. 5. Symbol Studies – The Bible has many symbols, including numbers, colors, and tangible objects used as symbols in various places. In many cases, understanding a symbol is the key to understanding an entire story or teaching. Symbols indicate eternal value, eternal meaning, and eternal reasons. For an object to be a genuine symbol, the meaning associated with that symbol must run from cover to cover in the Bible. Among the symbols that make great studies are: gold and silver, wood, crown, seals, stone vs. dust. Objects that are filled with symbols make good studies, including the Ark of the Covenant, Noah’s ark, Nehemiah’s wall, and Daniel’s den of lions. Ask the Holy Spirit to make the meanings of the symbols known to you and be sure to check and cross-check your interpretation of a symbol to make certain that your interpretation is valid. A true symbol does not mean one thing in one place and another thing in another place–it must have a consistent meaning throughout the Bible. The more you read and study your Bible, the more you will want to read and study it. Its spiritual riches cannot be fully mined in any one lifetime…that’s all the more reason to begin today and continue reading and studying every day for the rest of your life!